This excellent recipe comes from Nigella Lawson’s new book Kitchen: Recipes from the Heart of the Home. Of course her finger-licking fridge-raiding foxy flirt TV persona is a wicked self-parody more outrageous than anything an impressionist could achieve, although Ronni Ancona comes close. I would be a liar if I said I didn’t find her extremely attractive, and the same could be said for many bloggers (male and female) I have contacted. Children – who are perhaps more honest about their tastes than the rest of us – seem to have an overweening preference for carbohydrates, and I am more than happy to exploit this. If I’ve been working late, am feeling lazy, have forgotten to go shopping or suddenly find out that their friends are staying over and I don’t know what they will or won’t eat, I reach gratefully for a packet of pasta. I can honestly say I don’t know how parents managed to feed their children in the days before pasta became universal culinary currency. Oh, yes I do, actually: they didn’t care whether we liked what they cooked or not; we just ate what we were given. My children wouldn’t care if all I ever gave them was pasta with some bottled sauce poured over, and I don’t deny that’s sometimes indeed what they are given; but to please myself, and them, this is what I make when I get it together a little. Making this is hardly effortful; the potatoes cook in the pasta water – requiring a little extra time, nothing more – and the pinenutless pesto is whizzed up easily by the processor. 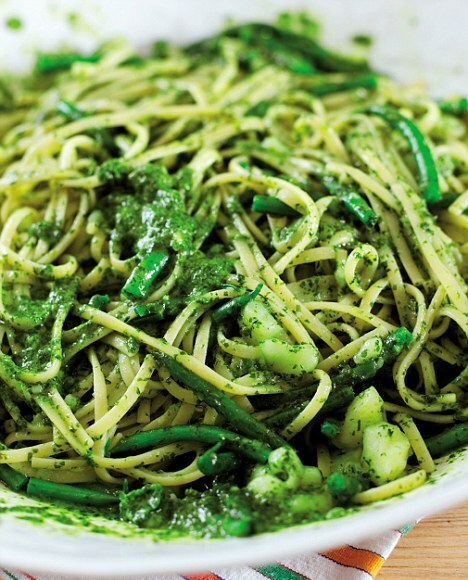 And if you’re going to do this recipe, then do make the pesto yourself. Using pesto out of a jar is nothing I’d ever apologise for, but this is a dish in itself and needs to be kept distinct. For those who feel cooking potatoes with pasta is playing too much into the hands of kiddie carbomania, know that this is a Ligurian tradition. And it really works: the potatoes thicken into a sweet sludge to which the pesto adheres, to make a fantastically, elegantly comforting and fragrant strand-coating sauce. The green beans add to the verdigloriousness of the whole, making you feel good that you are getting the children to eat vegetables. That said, I remain quite adamant that there is no such thing as ‘children’s food’, that food is food and that’s that; this makes a perfect supper for grown-up company, too, and certainly earns a place in my Last Meal menu. Put the prepared potato chunks into a large saucepan with enough salted water to take the pasta later, and bring to the boil. Cook the potatoes until tender, about 20 minutes, then add the pasta. Check the packet cooking instructions, and at about 4 minutes before the end of the specified cooking time, add the green beans. If you are using artisanal egg linguine, which takes less time, you will need to alter your strategy. While this is bubbling away, whiz the ingredients for the pesto in a food processor. Before you drain the saucepan, remove and reserve about ½ cupful of the cooking liquid. Tip the drained potatoes, beans and pasta back into the dry pan. Add the pesto from the processor and enough cooking water to give a runny sauce that coats the strands of pasta as you work it through with a fork or pasta claw. Serve immediately. This entry was posted on September 7, 2010 at 9:31 am and is filed under Food with tags basil, cookery, cookery books, cooks, extra virgin olive oil, garlic, green beans, linguine, nigella lawson, parmesan, pasta, pesto genovese, potatoes, recipe, ronni ancona, women, writers. You can follow any responses to this entry through the RSS 2.0 feed. You can leave a response, or trackback from your own site. Love Nigella Lawson. Probably too obvious as I mention her a lot in my blog. This is my current favourite pasta dish. Double carbohydrates and pesto. Yum. Thanks for your comment Michael. I love Nigella Lawson’s way of writing about food. I halfed all the measures for a meal for two and even that amount was too much. However as it was that nice we returned to finish it later in the night. A simple dish yet amazing. Thanks for that comment, Jamie. Nigella would be proud of you. hi, i m from Genova. olive oil is ONLY extra virgin, not just for pesto but for every uncooked dish in italy. and u should add also few pine cone seeds or however they are called.